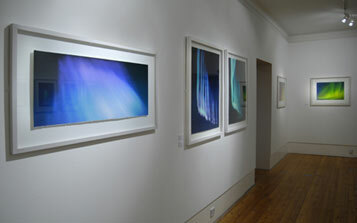 The theme of this exhibition is the northern lights or Aurora Borealis, with its inspiration coming from the artist’s initial experience of witnessing this phenomenon. As an elusive subject, rarely seen in Scotland, the works have been created as visualisations or reconstructions of the northern lights, employing different vantage points and representing them as though seen from both above and below. 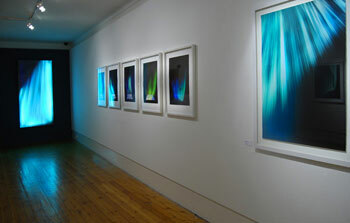 “In 2004/5, I created several pieces including an animation based on the Aurora. These works stemmed from my first-hand experience of witnessing the northern lights in Edinburgh during what was an amazingly strong display, being visible overhead, despite the streetlights. 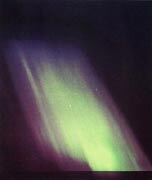 When seen in the sky, the Aurora appeared to move as gestures of light flashing across the sky. I became intrigued by their almost primeval, timeless quality and fascinated by their evocative mystical and luminous energy. The works were created by initially drawing with pastel and painting gestural brush marks onto paper. These marks were scanned and combined with photographic imagery and then digitally manipulated extensively, transforming them into light motions on the screen. Many of the prints were then developed further as original prints using the traditional printmaking processes of screenprinting and lithography. Skylight is a large format digital print, created at The Centre for Fine Print Research, University of West England as part of The Perpetual Folio, 2005. Although I had been using digital imaging as part of my working practice for over 10 years by this point, this was the first time I produced a work where the digital print was the end result. This led to the series of digital prints that became the Skylights series. That a skylight can also be a small window or opening seemed fitting in making reference to the small area near the magnetic poles where the Aurora enter into the Earth’s atmosphere. I am intrigued by this phenomenon of energy that takes on such a physical form, materialising as a curtain of light suspended and moving in the sky. This led to the Veil prints which were constructed from pastel drawings, digitally assembled, to suggest a solid three-dimensional form, reminiscent of idealised 3-D modelling. The rarity of the Aurora adds to the intrigue surrounding it, as does the realisation that its origins link our physical world to the intangible and astronomical world; it could be said that this phenomenon is a physical manifestation of the mysterious and mystical that we all yearn for. The Aurora has led to many different explanations in folklore throughout the world, the Canadian Inuit people, for instance, believe them to be messengers from the Gods. In Shetland, a lively Aurora display is known as The Time of The Merry Dancers. Current scientific understanding links the Aurora with sunspot activity causing solar flares of charged particles which are directed by the earths magnetic field, the Magnetoshpere, towards regions around the earths magnetic poles. Thankfully, for the romantics, there are still many aspects to this phenomena which is not fully understood, or can be fully predicted, ensuring that it remains as a rare, elusive treat. The Aurora animation was developed from the same source material as the prints, expressing more about the energy of the lights. As a new departure for me, working with the possibilities of animation was very exciting, enabling me to explore the themes of movement and sequence in a way that I had only previously represented in still imagery. Each frame for the animation was created individually. I came to think of the piece as a series of moving paintings. The luminescence of a lit screen or projection also felt appropriate considering the subject matter and this led me to consider making lightbox pieces. I often work in series to express movement, change, the passing of time and the interconnection of different elements. I find myself drawn to how nature is represented by science, through this filter of plan-like views and diagrams it has become our modern way of comprehending the abstract organic systems of the natural world. 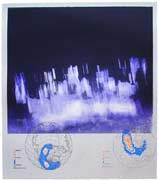 The series of prints ‘From the Atmosphere’, 2003, explored a response to climate change using the reference of meteorological satellite images. Adopting various diagrammatic representations of weather patterns to create sequences combined with abstract forms suggestive of weather fronts and cyclones. The Aurora animation was developed from the same source material as the prints, expressing more about the energy of the lights. As another new departure for me, working with the possibilities of animation was very exciting, enabling me to explore the themes of movement and sequence in a way which I had only previously represented in still imagery. Each frame for the animation was created individually, I thought of the piece as a series of moving paintings. The luminescece of a lit screen or projection also felt appropriate considering the subject matter. Aurora, animation with sound track, 2004, running time, 4 minutes.